PresentationPRO is ideal for use whenever multiple A/V sources must be switched to provide a professional quality presentation. Typical applications include live events, corporate boardroom presentations, church services, education and meetings. Categories: AV Presentation Rentals, Video Mixers, Video Rentals. This compact, reliable system simplifies the task of supporting professional quality audiovisual presentations. 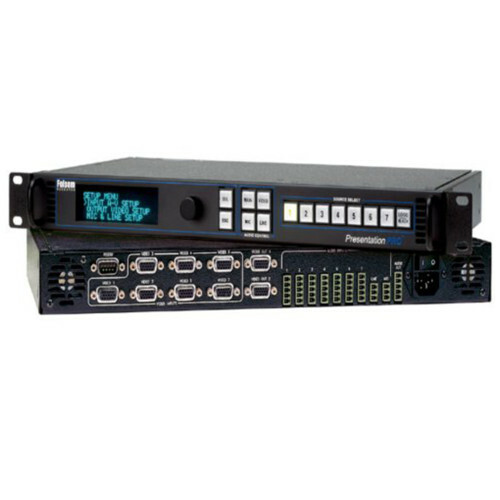 The unit combines a seven input A/V router, a high performance video scaler, an audio processor, and a full-featured control panel in a single integrated package. Seven universal A/V inputs accept composite video, s-video, component, computer, HDTV formats, as well as associated stereo audio signals. 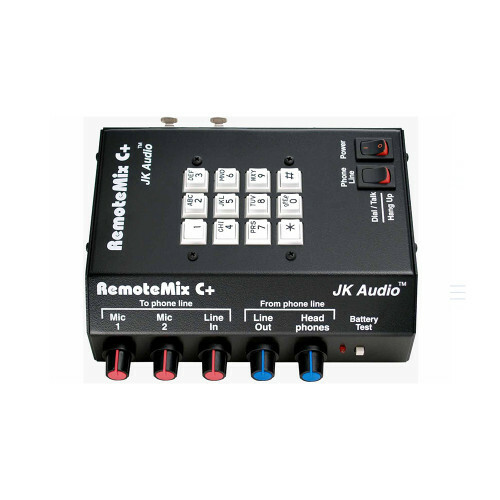 The unit also accepts two nonswitched audio sources (LINE and MIC) that can be mixed with the audio from the selected input channel. The input video is converted directly to the native resolution or “sweet spot” of the projection device to optimize image quality. PresentationPRO supports seamless transitions including cut, fade, dissolve, and wipe effects when sources are switched. The operator can also store a high-resolution image (typically a LOGO) for quick recall. PresentationPRO’s user interface simplifies system set-up and adjustment. Audio Inputs Universal A/V Inputs: (7) stereo audio channels, 5-pin MCO Male connector Microphone Jack: One non-switched MIC input, 3-pin MCO Male connector| Line Input: One non-switched LINE input, 3-pin MCO Male connector Audio Levels: Accepts Consumer or Professional signal levels Audio Mixing: MIC and LINE audio are mixed with audio from the selected A/V input Audio Outputs Output: (1) stereo audio channel, 5-pin MCO Male connectors Audio Levels: Outputs Consumer or Professional signal levels User Controls User Controls A/V Source Selection: Illuminated keys support selection of 7 A/V inputs or a stored LOGO image Audio Volume/Muting Control: Independent control for Master Volume, LINE Volume, MIC Volume and each of the seven A/V inputs Video Transition Effects: cut, fade, dissolve, and wipe effects with programmable duration Set-up Controls: Electro-luminescent display, control knob, and 6 keys provide a menu-based front panel interface to simplify set-up. Video inputs Universal A/V Inputs: (7) high bandwidth video channels High-Resolution Video: Supports conversion of RGB videos with horizontal scan rates up to 100 KHz and resolutions up to 1600×1200. 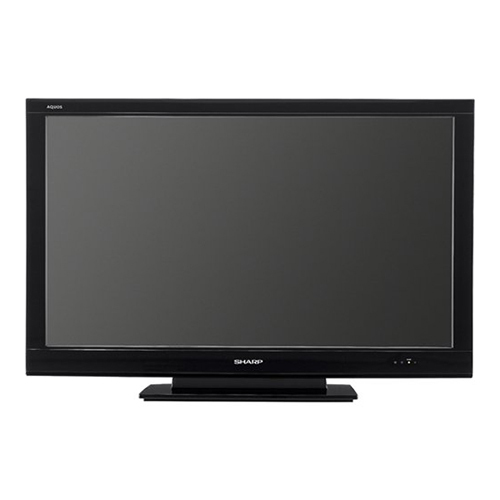 Videos with progressive 480p and 720p HDTV timing are supported. RGB input levels are independently programmable. 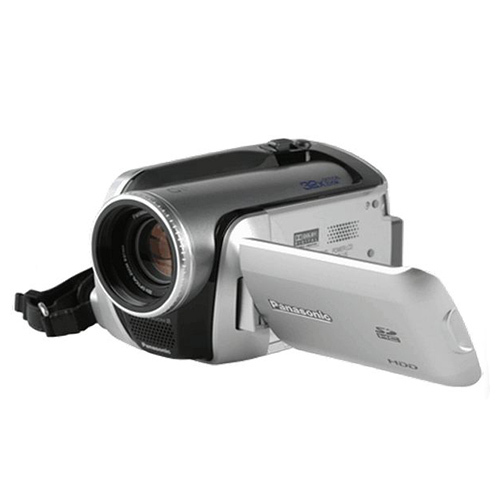 Standard Video: Accepts RGB, YUV, S-Video (Y/C), or NTSC/PAL video formats. Input levels are independently programmable for RGB and YUV sources. Programmable luminance and chrominance levels are provided for S-Video, and Hue and Saturation controls are provided for NTSC/PAL inputs. Synchronization: The unit automatically locks to the incoming video source. Input Sync Signals: Sync-on-Video; Separate C or H,/V Connectors: HD-15 Video outputs High-Resolution Video: User programmable output formats; VGA (640×480), SVGA (800×600), XGA (1024×768), SXGA (1280×1024), HDTV 480p, 720p. Main Outputs: Two independently buffered channels provide RGBHV signals on HD-15 connectors. Output Sync Type: Separate C or H/V Remote Control RS-232 serial port for real-time control, optional Presentation Controller PP-0701 Environmental Temperature: 0-40 degrees C; Humidity: 0-95% noncondensing. 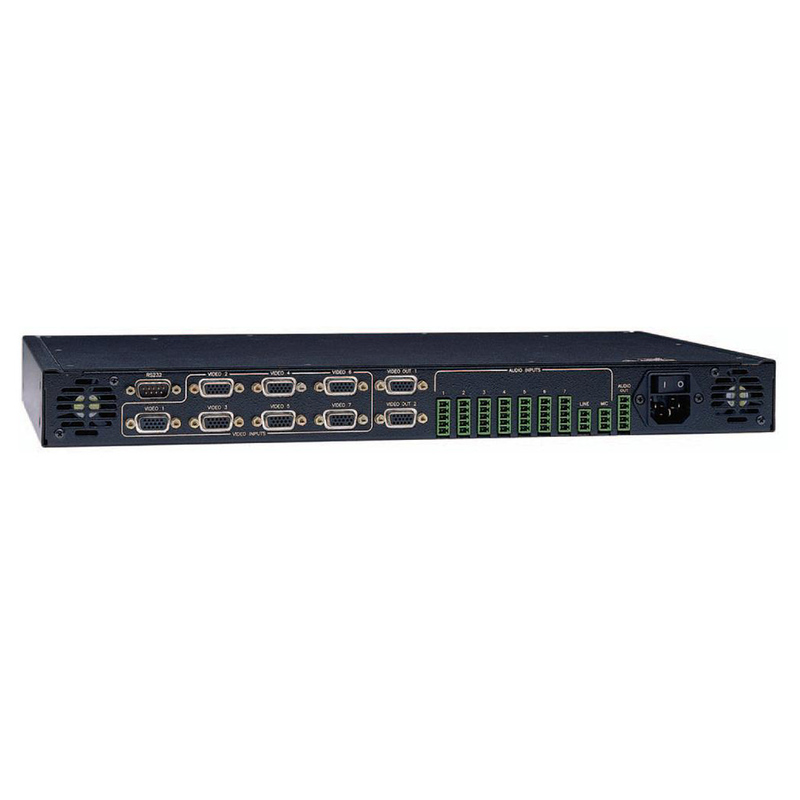 Input power 115/130 VAC, 47-63 Hz, 1.0 – 0.5 A Physical Height: 1.5″ Width: 17″ (43.2 cm) or 19″ (48.3 cm) with rack-mount option Depth: 13″; Weight: 9 lbs.